The U.S. Supreme Court heard arguments recently in a Texas case that challenges the way nearly every U.S. voting district – from school boards to Congress – is drawn. The case asks the court to specify what the word “person” means in its “one person, one vote” rule. The outcome of the case could have major impacts on Hispanic voting strength and representation from coast to coast. Ever since a series of landmark rulings in the 1960s, districts have been drawn “as nearly of equal population as is practicable.” (As Supreme Court Chief Justice Earl Warren wrote for the majority in Reynolds v. Sims, “Legislators represent people, not trees or acres. Legislators are elected by voters, not farms or cities or economic interests.”) The high court didn’t directly say what “equal population” meant, but states and localities have almost invariably used total population figures. And that population is determined by the decennial census. 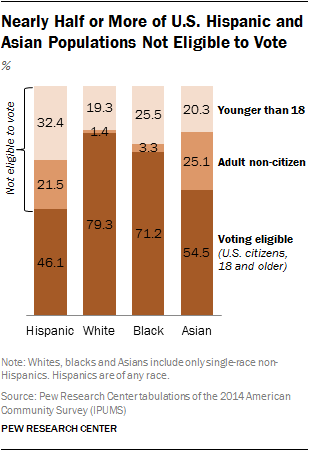 The distinction between residents and voters is a big one, because in many states, districts with nearly equal total populations can have dramatically different numbers of eligible voters (that is, U.S. citizens ages 18 and older). We approximated the disparity using 2014 demographic data for all 435 U.S. House districts from the Census Bureau’s American Community Survey. Eligible voters ranged from 81.2% of the population (Florida’s 11th District, located north of the Tampa Bay area) to 43.2% (California’s 40th District, comprising East Los Angeles and adjacent communities). California’s 40th, in fact, has barely half as many voting-age citizens (308,347) as Oregon’s 4th District (604,980, the most of any district in a multi-district state). As the map (above) and chart (right) might suggest, there’s a strong negative correlation between share of eligible voters and share of Hispanic population. Of the 25 districts with the highest Hispanic population shares, 18 also are among the 25 districts with the lowest eligible-voter share. This is because so many Hispanics aren’t eligible to vote, either because they’re not U.S. citizens or because they’re younger than 18. By our calculations, only about 46% of the nation’s more than 55 million Hispanics are eligible to vote. 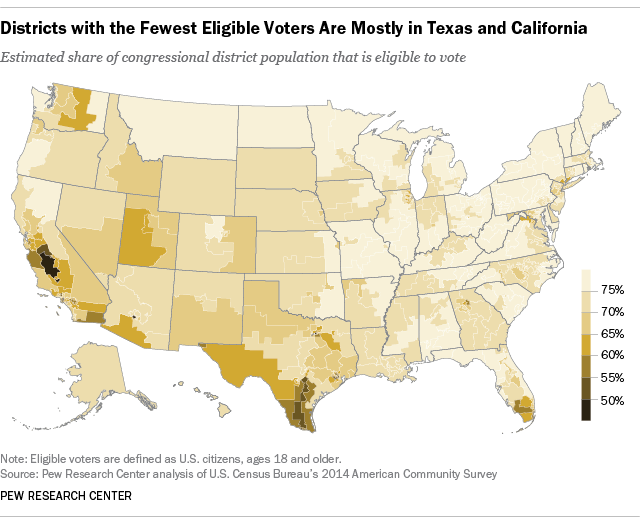 There also are clear partisan differences between districts with high and low shares of eligible voters. Of the 33 districts where voting-age citizens make up less than 60% of the population, 28 are held by Democrats; Democrats represent 18 of the lowest-ranking 20. On the other end, Republicans represent 35 of the 47 districts where 77% or more of the population are voting-age citizens, and 17 of the highest 20. What would happen if the Supreme Court were to rule in favor of the Texas appellants (who, it should be noted, already have lost at the district-court level) is unknown. One possibility is that districts with relatively few eligible voters would be redrawn to include more of them – which could mean bringing more whites and Republicans into what are now largely Hispanic, Democratic-voting districts, or combining such districts to bring up the eligible-voter population. And that, in turn, could affect Hispanic representation in the House, which has risen from five in 1973 to 17 in 1993 and 28 in 2013. Most important, while the American Community Survey asks about immigration and U.S. citizenship status, the decennial census does not. And because the decennial census counts everyone (which the ACS, being a sample-based survey, does not), it has been the only source of data for drawing district lines (a point addressed at length in an amicus brief filed by several political scientists). That means that if the Supreme Court requires districts to be drawn with equal numbers of eligible voters, it may also have to decide just how those eligible-voter numbers are to be determined. Note: This post was originally published on June 3 and has been updated.